Now we come to that third rail of education - parents. I have said this a lot in person but naturally, it's a dangerous subject. Just like the first rule of Fight Club is not talking about Fight Club, the first rule of parenting is you don't criticize others' parenting. Everyone has their own ideas about what is "good" parenting. What might really help the education conversation - is for districts to express to parents what would help teachers/schools to do a better job. This is NOT telling parents "here's what a 'good' parent does" but "here's what would help your teacher/district." I will note that maybe there should be a letter from the PTA to the school/district saying what would be helpful for parents as well. What would make your life easier as the parent of an SPS student? And what's an over-involved parent? I know from past experience that teachers/principals can both love and dislike AL parents. On the one hand, those parents will work very hard for their child's school and, on the other hand, they get very much into the weeds of education. But is that better or worse than a parent who isn't involved at all? Wow. Listen to this less-than-3 minute video of noted teacher evaluation expert, Charlotte Danielson, talk about teacher evaluation. My favorite line? "You can't fire your way to Finland." Should be required viewing for every school district administrator. Next favorite line? "What can count as evidence and how can that be attributed to an individual teacher?" She also says, at the end, "No one on the planet has figured out how to do that." Boom! Shout out to the Chief Sealth Marching Band who appeared in yesterday's Macy's Holiday Parade. Good job, kids! In bad news, apparently, in some parts of the country you can get arrested for picking your kids up at school...on foot. To note, there are no Director Community meetings tomorrow. Here's a video from Night of Too Many Stars (back in October) where we meet Jodi DiPiazza, an 11 year-old with autism. She and Katy Perry sing "Firework." "People with Autism shouldn't be written off. They deserve, like everyone, the chance to reach their potential," he said. "Let's take a look at what happens when someone actually gets that chance." Let's give thanks for all those gifts. 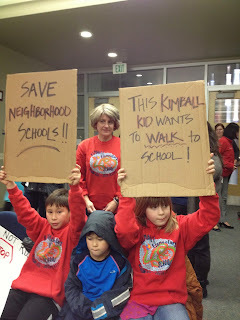 Chris Korsmo is CEO of LEV but also a Board member of the Washington State Charter Schools Association. Mary Beth Lambert who is the press person for LEV is also the press person for the Washington State Charter Schools Assn. LEV is evolved just as the Alliance for Education has - in less of a cheerleading role for public education to more of a hard-nosed ed reform agenda. While they have several items on their agenda, it looks like more of their work leans towards charters. LEV was one of the lead plaintiffs on the McCleary case and bless them for that. But their work is all over the place and it's hard to pin down what it is they are truly doing. And, it looks like the Gates Foundation (and their money) is driving that work. Update: I think some of my confusion over who's in and who's out is that some of the letters of intent were filed under the non-profit name and then the actual charter school name was used for the application title. Figuring this out, I learned (via a California activist) that the Coral Academy of Science is a Gulen-affiliated charter school. Gulen is the largest charter operator in the country with 140 in 26 different states. The schools deny that they are part of the Gulen movement and yet the evidence is that they are. Here's a good site to explain the issue. There have been huge issues over these schools in Hawaii, Utah, Georgia, Ohio, Arizona and Texas (which wants them out of the state). The FBI and the Departments of Labor and Education are investigating them. They hire mostly Turkish teachers, saying there are not enough American teachers available. From the NY Times. A lengthy article from City Journal about the history of Gulen. Learning about and examining any charter operator who has charter schools in other states IS part of the wording in I-1240. I will be letting the Charter Commission know about this issue. Plus three applications to Spokane School District. The 22 applications are out of 28 letters of intent to the Charter Commission. One that seems to be missing is the Cesar Chavez Charter School in Yakima. I'll have ask about that one. The applications are not yet available for review. Spokane School District has these three: Pride Prep, 6-12 school; Pioneer School (private trying to convert for highly capable learners); Academy of Arts and Sciences. In other charter school news, Tacoma School District seems to have flip-flopped again on the issue. Now their School Board says they are NOT going to apply next year to be a charter authorizer. They seem to be unease on the clarity of their role as authorizers and waiting for the outcome of the lawsuit against the charter law. News that President Smith-Blum fell on her way to a restaurant and broke her arm. We wish her a speedy recovery. From The Guardian, kids of today can't run as fast as their parents. On average, it takes children 90 seconds longer to run a mile than their counterparts did 30 years ago. Heart-related fitness has declined 5% each decade since 1975, for children aged 9 – 17. If you have a girl, you might want to watch this video of a young woman who gives voice to body image issues. If you like powerful storytelling, it's also a must-listen. It appears to be a performance competition/show and the crowd is with her as she gets deeper into her story. Want something for the kids to do while you're preparing that Thanksgiving meal? More DIY Star Wars Snowflake Templates. Locally (and thanks to reader Carolyn), news from Real Change newspaper about getting food to needy students for the weekends. While the kids of John Hay Elementary School play outside, LaRock carries bags of food into classrooms and surreptitiously slips them into the backpacks of 15 kids at the 500-student school on Queen Anne Hill. Each bag contains cans of soup, crackers, tuna, granola bars and fresh fruit. There’s enough food to get a student through the next two days: two breakfasts, two lunches, three dinners and snacks. Administrators slip the food into backpacks when students are outside of the classroom to avoid stigmatizing the students receiving the help. So anti-hunger nonprofits decided to stop relying on parents to get the food from the food bank and instead bring it directly to the kids to take home. The Queen Anne Helpline and the West Seattle Food Bank launched their programs in November at a handful of neighborhood schools, and hope to expand them to more schools. Speaking of poverty, a great article from the Huffington Post (with graphs) about the effects of poverty on student test scores. Work is continuing of the first of two Advanced Learning Taskforces. I have only been able to attend one meeting (on November 5th) but it was a good one. The oversight and facilitation of this Taskforce is quite different from the last one and for the better. Here's a link to the AL webpage; details of the meeting schedule,minutes and PowerPoint presentations are available at the bottom of the page. The facilitator, Barbara Grant, is great. She keeps people on task, keeps a careful eye on the clock and provokes expanded thinking. Interim director Stephen Martin organizes the meetings and the agenda but wisely keeps out of her way. It was noted that in late January, there is some kind of gifted institute at Whitworth University (by Spokane) about ongoing issues in identifying gifted students that several members of the group were to attend. The other speaker was Dr. Nancy Hertzog from UW's Robinson Center for Young Scholars. Boy, what a dynamo and what a great presentation. Here's her PowerPoint. Her presentation was around finding the youngest of children - preschoolers. She said she had an interesting experience herself where in one district her child was gifted but she moved 10 minutes down the road and found her child was not. She noted that it is difficult to recruit students after 8th grade and putting the money in the early years is the best place to find these students, both for equity and better academic outcomes. She said something pretty telling which that you should treat all students as if they have potential because "it doesn't always show at once." She said that parents are really the best identifiers of talent in young children (but not teens). She also said that those "behavior" checklists don't always work well but it's important to use multiple measures and not just IQ tests. She also said "intelligence is malleable, not static, and prior experience matters." She said poverty has a profound impact on lives of these children. She believes in a "strength-based" approach with project-based learning. She was pretty clear in saying that reading at 3 or 4 does NOT mean a child is gifted and writing and reading don't mean a child can learn how to read a graph or a map. Her verdict on any program? Professional development is key. She said the teacher acts more as a facilitator for these types of children. And naturally, class size matters (as it does for every classroom of younger children). She also said that rich curriculum works for ALL students even if they aren't found to be gifted. This is the meeting where the Taskforce was told they may pause their work in January "we don't have any big hurry here" so clearly is the message they are receiving from the top. Why, I don't know. The next meeting is Tuesday, December 3rd at 10 am at JSCEE. I attended the first hearing on the constitutionality of I-1240, the Washington State Charter School law. To be clear, this hearing was pretty meaningless. No matter who wins or loses, this case will appealed all the way to the State Supreme Court. None of the decisions in any of the lower courts will matter. Only the one decision from the State Supreme Court will decide this. My husband and I have been doing these various stairwalks around Seattle (we've done 14 so far, all over the region). Great exercise (you'll find stairs you never knew existed), wonderful neighborhoods and, of course, the beauty that is Seattle. On today's walk around Alki Beach and environs, we went into the Schmitz Park Reserve, a bucolic and muddy, area. I found this sign and it made me smile and wonder what happened to all those bi-centennial Schmitz Park kids. Or, what does the fox say? It all sounds a bit futuristic and creepy and I would not be happy if either of my daughters were part of the study. But I, for one, will give Gates the benefit of the doubt. For starters, it’s truly a small sum in the scheme of things. There are no easy answers when it comes to fixing education in this country. Let’s be glad that Bill Gates is at least trying, even if he makes some controversial decisions along the way. Kind of breathtaking but you know what? We actually have some paternalistic thinking like this right in SPS (and I'll get to that when I write about student data privacy where apparently some staff members believe that some parents have fewer rights than other parents). we won't know for probably a decade. There are two maps that show two different things. In the future (by 2020) map, the area you are talking about is included in the Schmitz Park attendance area. However, the map for implementation for next year (2014-15) does not include that area since it is not being implemented next year. The official time frame for Obama’s visit has not been released, but drivers should be prepared for delays on major highways including Interstate 5 for the presidential motorcade. The Seattle Monorail tweeted that the monorail will be shut down between 8 p.m. Sunday and 8:30 a.m. Monday due to security. Also, a free hot chocolate for your child when you buy an espresso with this coupon from Starbucks. Always nice to get a freebie. Fun video of what little girls REALLY want to be doing from toymaker, GoldieBlox. 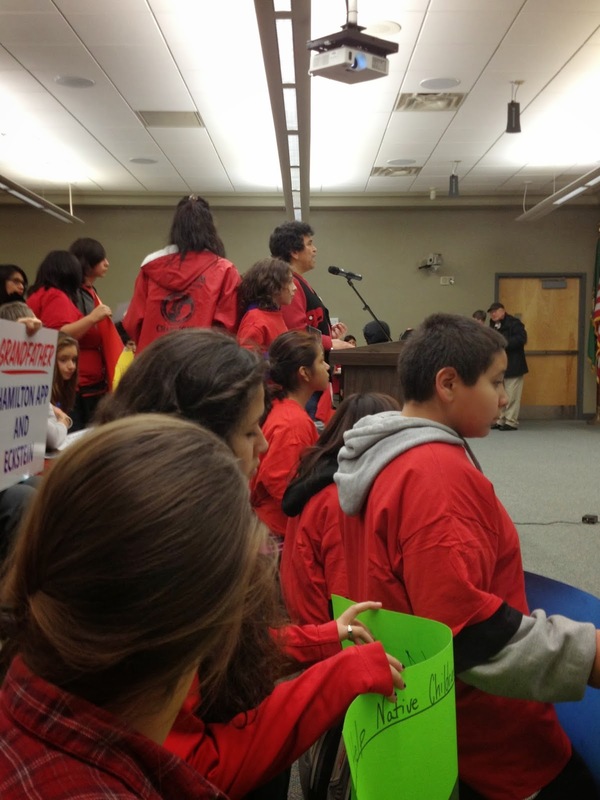 Today will see the long-awaited hearing on the Washington State charter school law. Charlie or I hope to make the hearing and will let you know what is said/outcomes. What a long week it has been. President Smith-Blum told the audience last night that she planned to sleep in today (and that was at the beginning of the meeting). I plan to take some time off next week myself. Thanksgiving IS a good time to reflect, resolve and be grateful. And mostly, to enjoy your family. Eric Muh's science class at Ballard High has signed up at Donors Choose for some financial help. We are a large urban comprehensive high school. Teachers have a variety of students from English language learners to special education students with a variety of individual needs to Advanced Placement students. We'd use the laminator for all these classes. You may recall that Donors Choose is a great organization that allows teachers to ask for help - big and small - for their classes. If there are other SPS teachers/schools asking for help, please let us know and we'll add them. That was fast (good job, SPS staff). Here is the district's overview of the approved Growth Boundaries plan. I don't think it answers all the questions you have but it is a good overview. I have never asked the school district to do anything that they didn't promise to do. The fact that I have to ask them to do things so often is a testament to how rarely they do what they promise they will do. We hear - all the time - about how there is a division of authority with the Board focusing exclusively on policy and governance work while the administration and management decisions are delegated to the superintendent. If that were true, then the school assignment decisions should never have been subjected to a Board vote. Drawing attendance area boundaries is clearly an administrative or management decision - not a policy decision - and should have been delegated to the superintendent. Policy 3130 is nearly all that the Board should have to say about student assignment. The Board should have delegated the decision to the superintendent from the start. The only thing they need to add to the policy would be a reminder to the superintendent to live up to the District's stated values like transparency and community engagement, and to direct him to comply with laws and policies. But since the entire thing was going to culminate in a Board vote, and since Board votes are political decisions, the data, the reason, and all of those values and rules became subordinate to the political process. The staff didn't need to adhere to data or reason, they didn't need to be transparent or engaged, they didn't need to adhere to policy, because the whole thing would be dumped in the Board's lap in the end and the Board would be responsible for all of it. That's part of the reason that community engagement for the decisions was poorly conducted when it wasn't completely non-existent. The Board's charge to the superintendent should have put more emphasis on talking to the people who are directly impacted by the decisions. This could have been done well if it were not politicized. It could have been done well if the focus had been placed where it belonged instead of on the politics. Patu - includes where it has to come to Board? Yes. Carr - feels redundant - I know what you are doing but I feel like Tracy &Co are doing this already. Peaslee - not directing staff but acknowledging concerns of public. Poke me with a fork - I am done for tonight and will review the tape for the rest of the meeting. Carr - how is this different from what is currently proposed? Libros - right. The thing to understand is that if lines or patterns look like they don't make sense, I understand that but it was made based on the numbers. If Kimble stays in Mercer, Mercer will be overcapacity. If some don't go to Meany, it will be underenrolled and Washington will be overenrolled. Smith-Blum - 8 elementaries to Meany Middle Schools and my point is the unpredictable growth in Central- north. We are going to have, what I believe and community analysis, we are going to have huge growth. Stevens went from 48% -74% birth-K capture rate. Carr - I get that but trying to map that to middle school in 2017. DeBell - We have been working six months with staff's data and it's great that we have community analysis and data but there's no logic to overloading Mercer. Smith-Blum - if we stick with current patterns, we WILL overload Mercer. Peaslee - if we don't do this until 2017, can't we delay this decision? Libros - as routine part of work, we look at data to see which to implement in plan but need a starting point to work from. Peaslee - change amendment a year from now with more current numbers and then we would recommend changes based on that. Smith-Blum - I would like to embed into plan for Superintendent to look at new data over next two years. McLaren - not necessary because of part of staff process? Carr - don't know that Growth Boundaries but NSAP says that. Changing amendment - to review feeder patterns but go forward with what is in Version 3.0. DeBell - like to know what staff is comfortable with including housing starts, etc. More staff and time? Libros - we do have a contractor collecting data and when we get past this, we will get back to that. It will help us refine and be more precise. Had to re-read three times with the changes. Libros - identifies feeder patterns, see initial numbers of how many APP students expected over next few years and feeder patterns. Long discussion at Work Session of this issue. Start JAMS and then W-P program, and potential changes to APP but have flexible capacity w/o changing structure. If okay at JAMS, then they could phase out at Hamilton. Can expand and contract without changing the entire patterns. Peaslee - This is for alternate #2? Peaslee - what would be impact of grandfathering Hamilton APP? Libros - no one liked 6th grade roll-up even if a lot of them. Moved to geo-split model and that's what we built this around. Peaslee - What is impact of grandfathering at Hamilton? Libros - Eckstein and Hamilton would both have severe capacity problems. Hamilton cannot have portables and Hamilton is struggling this year. JAMS would then be underenrolled. Smith-Blum - cohort of APP in 8th grade at Hamilton at not that many, would that break the camel's back? Other staff - did look at numbers and there are 68 8th grade APP students. Comes down to grandfather into Hamilton, that would put them over by that number. 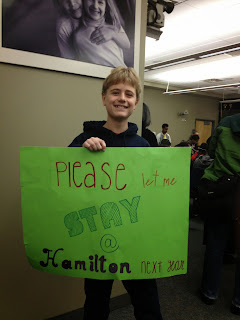 Peaslee - public testimony tonight said that Hamilton APP sent to JAMS but not Gen Ed Hamilton students? Martin- Morris - if you something different for Hamilton rather than Eckstein, it's an equity issue so you'd need to do both. McLaren - issue of students being in multiple buildings but maybe not as bad if they move as a cohort. Smith-Blum - I broadly agree with amendment but we are talking about human beings. We have to start a JAMS cohort. Very sympathetic with 8th graders. I hesitate to vote against it and this is a special group that has been moved around repeatedly. I hear you Director Martin-Morris about equity but I would appreciate the consideration for these students. DeBell - already over the numbers and we don't have the annex at Lincoln now. Martin-Morris - there is no space and we will tip Hamilton over. Amendments #5 and 6 were withdrawn earlier. He stated the school was underenrolled and this could fill the school if it were an International School. This amendment postpones that and allows it to be an International School for a year while being an attendance area school and then make the decision for the change. McLaren - students can apply to any attendance area school? DeBell - nobody fights harder for their district than Betty Patu. That said, you reference District #7 which is based on voting precincts, are there issues there with attendance area boundaries? Patu - no, I don't think so. Flip Herndon was up first to talk about Growth Boundaries. Pretty much we've heard before; changes may come with each year. Staff tried to keep up with changes and can give impact/analysis on some of the amendments ("as much as we can" - which seems fair). DeBell - recommend to Chair that things will change if amendments pass. So they will move through the amendments first. Carr said they worked with Libros' team on boundaries to address these concerns. Peaslee - concern on the change in line between Sacajawea and Olympic View. An area with crossing two major arterials and up a hill to Sacajawea. Carr - would have done it if possible but not able to do now. Probably eligible for transportation. I'm uncomfortable making an 11th hour decision. Want to leave intact. Peaslee - in walk zone or eligible for bus? DeBell - I think amendment and process behind it is quintessential Director Carr. Wonderful amendment. Peaslee - if student lives on line of walk zone, can they walk to bus zone and pick up bus? Pegi - will look at transportation service standards and there are intermediary stops, we can consider that. Carr - Walk zone committee did consider this and work has been done and looking for solution. Amendment #3 - attached to Intermediate Capacity Plan so waiting until then for that vote. Director Patu came out like a lioness, saying that the district tends to start programs and then, if they drag, stop supporting them. She also said that no, she did not believe these kids could be served elsewhere. Peaslee said the commitment is there. They will take anything to continue on as a program (AS #1) and Indian Heritage, like WS, has been tossed around. Both know it will take work. Carr - So I would like to respond to Director Patu's comment about not working to help grow the school. We've had this conversation before when I was on the CAICEE committee and that was back in the '90s. She believes staff HAS tried. I've tried to listen to both groups and both are showing a willingness to work hard and I'm willing to take a chance on it. But I will be watching it closely. Smith-Blum - if there's a pathway forward, I know staff can help find it. Pinehurst is saved (to live another day). So they will move to Lincoln for two years and then (somehow) Wilson-Pacific after that. DeBell asked that APP @ Lincoln be considered given it was not "fair" to do this out of nowhere. Peaslee is really fighting back with data on Pinehurst and its relationship to the Strategic Plan. Pinehurst has been recognized by many organizations as a great school for students with different learning styles. The support is there, she says, for Native American program and Pinehurst to join together and work well together. Ron English - Spokesman for a team of staff. Needed to have community meeting at Thornton Creek and that happened. TC doesn't want to be a K-8 program and want to preserve integrity of program. Second issue in last two weeks about finances and whether estimates of per student costs were too high. Joe Paperman looked at that. When estimate was prepared several months ago, it was 125 students and now it's 150 students. That's his explanation of why it is lower. Third issue is instructional and revised BAR outlines this. Each Option school is unique with culture, values, academic approach, etc. Two Option schools in same building under same administration, you won't get two schools but some hybrid. So programs really need separate administrations to preserve a program (so says Ron English). Director Peaslee is saying "we must honor our commitments." To honor programs and serve our most underserved students (Native American, Special Ed and gasp! APP) is her message. Director DeBell is speaking. "Eight years is a long time." A long goodbye and he called out his policy work as being very important and how consistent policy matters. He also said that he worries about the turnover at JSCEE (he said he was sorry to say that but was very worried about it). President Smith-Blum thanked (without reference) the SPD for their work. Mentioned her amendments to the Growth Boundaries and working with colleagues in the wee hours of the morning (she said she would not miss that). She got a little misty-eyed when thanking colleagues and staff. So we are now about an hour and a half behind and they will likely take a break here and then come back and attack the Action Items. A show of FORCE from the Native American, Pinehurst and World School communities. Boy, the troops were really rallied and it was great to see such determination from these groups. There is a big NO to any kind of taskforce for either WS or Indian Heritage. I think the message is out that an SPS taskforce means very little with so many with so little follow-up and follow-thru. I think "we won't get fooled again" is the takeaway from these groups. The majority of the public testimony was around these three items. Pinehurst and Indian Heritage seem in total agreement on joining together and excited for the opportunities for each group. It was a beautiful thing to see. Now Peaslee wants to move one of her amendments but now backs off that. Now nearly 45 minutes behind. Onto Consent Agenda and Martin-Morris wants to move item #4 (Legislative agenda) off of it. Got that done. Peaslee says Joe Paperman reported where our budget is related to cuts over last five years. Referenced letter from Rep. Pollet and that our funding is where it was in 2008 and that should be added to Legislative Agenda. McLaren asked why it couldn't be delayed a couple of weeks. Banda seems to be unhappy at this consideration (but frankly, if the document needs a little tweaking do that and then okay it in December). Charles Wright has come to the microphone. For this Legislative Agenda that there are items that don't make agenda but we still address then ("a living document"). Carr says this document can be used for talking points. Patu thinks they can move it forward and then have an attachment with other items. Now 50 minutes behind. Vote was 6-1 with Martin-Morris voting no. I'm going to stop here and just take notes on the Public Testimony and come back with an overall sense of what was said. Erin Bennett is now speaking about DeBell and Smith-Blum and their service. DeBell was president no less than three times during his eight years of service. She reeled off the entire number of Board meetings that he has been at (a lot). Pegi McEvoy is now speaking about Smith-Blum. (Funny aside, some new people came in and when I showed them where we were on the agenda, they were horrified.) She said meetings with Smith-Blum were never "boring or routine" and called her "fun." She talked about her commitment to capital projects and her district and talked of Smith-Blum's "green" focus. Onto the Superintendent's comments. Wayne Barnett, Director of Ethics Commission with report on Ethics. In middle of three-year program for Ethics program for SPS. Training and advice and investigation. On-line ethics training happened this summer. Like to receive more requests for advice. Done more investigation than advice. 130 complaints to date, whistle-blower mostly. I'll get his report and get all the details. Program is working well with some growing pains. Native American parents and leaders speaking about Indian Heritage month. Native American students are still at the top for drop-outs and Special Ed placements (proportional to their numbers). One speaker said that we must - "Put our minds together to seek a future for our children." Another speaker is now talking about the late Native American leader, Robert Eaglestaff, who led the Indian Heritage program. Wonderful performance from MLK, Jr. choir and their director, Mr. White. They dedicated their second song, "I Believe I Can Fly" to the departing board members, Michael DeBell and Kay Smith-Blum. Very sweet. Since Blogger doesn't work well on my iPad, I'll just do multiple posts. It's now 3:54 p.m. There are about 25 people outside the JSCEE to rally for the Indian Heritage program. There is a petition to make Wilson-Pacific School a Seattle landmark (I'll see if it's on-line). I see Martin O'Callahan, the principal of the World School, along with many supporters. It's a sober (and very nice looking - everyone is dressed up) Board that is taking their seats (although Michael is down with crowd but this is his last meeting). Tired of all this growth boundaries talk? Let's have a laugh. A certain Norwegian Blue parrot is still dead, nearly 44 years after it shuffled off its mortal coil and joined the choir invisible in a famous television comedy sketch. But there is life yet in Monty Python, the singularly influential British troupe, whose surviving members are to announce this week that they will join together for their first live performances in more than a decade. Parents who want to give their children a little magic - funny and wonderful. Wish I had thought of this when my kids were little. Childhood is fleeting so let's make sure it's fun while it lasts. And someone with a sense of humor visits Starbucks and everyone else plays along. I have a couple of reporters looking for parents affected by the growth boundaries. If you want to speak out publicly, let me know at sss.westbrook@gmail ASAP. Leave a phone number if possible. To note (in case it got missed), the Native American SPS parent community is having a rally at 3:30 pm before the meeting. Wear red in support. If you are already going, please come and support these parents and students and their community. If you ARE going to the meeting, I urge you to get there early as it will likely be packed. I'm hoping they will have screens in the lobby for those who cannot get in to watch. I checked and the notation on the agenda under "Business Action Items - Motion to Amend the Agenda" is just there to quickly pull off all the amendments that the Directors are withdrawing, in order to save time later. The Public Testimony list is full with 25 people. I urge that if you see someone else speaking on your topic to give your space to someone on the waitlist with a different topic. (Like Special Ed or the Indian Heritage Program). Labels: 2013 growth boundaries, growth boundaries. I attended the 43rd Dems meeting last night; it's my district. As you may be aware, the election of Ed Murray as mayor means he leaves the State Legislature as senator. So his post needs to be filled and, so far, the only person to step forward is the one of the 43rd's representatives, Jamie Pedersen. (The other is Frank Chopp, the Speaker of the House.) Senator Murray is to resign on December 31st and the seat must be filled within 60 days of that date. Naturally, that means Pedersen's seat will be open and there are - so far - three candidates vying for the appointed position. (It seems a complicated process who gets the appointment. It was explained that the PCOs for the 43rd will vote, their rank order votes for all three are then sent to the King County Council who will make the final decision. Pedersen and Chopp spoke to the crowd about coming legislative issues. Their overriding message was that the Dems need to regain control of the Senate in order to move key issues forward including fully-funding education (and they both believe some kind of new revenue source must be found to fulfill the McCleary ruling mandate). Here's the thing: It feels like the Board and the staff could have cut up the Growth Boundaries plan, section by section, thrown the pieces in the air and picked 10 off the ground. I honestly worry that somewhere in there is something that many will have overlooked and/or will not like. I want to have faith but when the SCPTSA says the process wasn't good, it wasn't good. When Kellie, Meg and others who really see the weeds AND the big picture and are worried, it isn't good. When a program gets moved around before its review is finished, it's not good (that would be AL). When a school gets changed from a neighborhood school to an Option school without a single meeting of the school community, it's not good (that would be Dearborn Park). When parents cannot understand what is written or what it means, it's not good. As usual, parent Kellie LaRue distills it best and I hope the Board listens. What she has written could either be the roadmap to the future or tea leaf reading for what may come if they don't listen. Whatever the Board approves, will it turn out to be disasterous? Probably not but it WILL set the course for the district to equitably serve students or continue to limp along in a hodge-podge and less-than-clear fashion. Please prioritize the Student Learning experience first, capacity second and everything else thing else last. Above all, get 2014 right. This just came across my desk and, at this point, I agree. The agenda is a mess (not to mention the Growth Boundaries plan. There's now even some mystery motion to change the agenda (with no explanation of what). UPDATE: I checked in with the district as the Times had confusing information about whether ACEI has a lease for the Columbia Annex. The district has confirmed that there is no signed lease right now. They are negotiating for ACEI to provide direct services to students and must meet certain criteria for reduced lease rates. Seattle Police say they have made arrests and are searching the building as groups occupying the Horace Mann school are being cleared from the Seattle Public Schools property on E Cherry near 23rd. SPD says that three four adult males were arrested as police continue to search the building after entering the barricaded facility Tuesday afternoon. CDN is reported that the police began the raid around 1 p.m. The police had been planning a careful raid, making sure there were no children at the site. They report only four ment in the building, all were arrested. The arson and bomb squad was sweeping the building for safety. The Seattle PI reports that police asked Garfield High to "shelter in place" and had extra officers at the campus. It is a good outcome that it ended peacefully with no one hurt. There is quite a lot of talk leading up to Friday, November 22, 2013 as the 50th anniversary of the assassination of John F. Kennedy. Many news outlets are asking, "What do you remember of that day?" and I realized that most of the readers of this blog were likely not even born then. I can tell what I remember as a very small child. I was with my mother in the town general mercantile store. (I know, it sounds very old-timey but we lived in a company town and they owned a large store that housed a combo Macy's with a supermarket.) It had a large open floor plan and you could look up and see shoppers on the second floor. It was a beehive of activity and sounded that way all the time. I just remember how there was some announcement over the loudspeaker and then it was so quiet. I could hear ladies sobbing and my mother was teary-eyed. We went home. I remember a couple of days later on tv., watching the funeral procession and how much I liked seeing all those black horses. I wondered about the little girl standing next to her mother and the little boy who saluted. I didn't really know who there were until much later. I cannot see that footage today without crying. You may not have lived through the JFK assassination but you did live through 9/11. I urge you to write down what you remember that day if only for your own family history. Ask your children if they are old enough to remember. It is a valuable piece of history to have these remembrances. TLC has shown, "Letters to Jackie", a documentary based on the book about many of the letters that ordinary citizens wrote to Mrs. Kennedy after her husband's death. It is quite moving and show that everyday stories do matter. Also, here's a conversation starter for your next dinner party - if they had lived - JFK, RFK, MLK, Jr. or Malcolm X - who would have made the biggest impact? I suspect MLK, Jr. because of his ability to get people to listen and to move people to action. It's probably not really helpful to think about "what if" but you do sometimes wonder, given the leaders we have today. From the Central District News, a trailer was released for a film, One Square Mile, that was shot throughout Seattle including Garfield High School. Many recognizable sights and yay! Garfield. I learned that there is a subtropical storm brewing over the Central Atlantic about 600 miles off Bermuda. Melissa is showing signs of developing a tighter core of convection (thunderstorms) close to its center, signaling that it may be trying to become a fully tropical storm. However, an approaching cold front over the western Atlantic should catch up to Melissa by Thursday, heralding its inevitable transition to a post-tropical low. Melissa is no direct threat to land, but its large wind field is generating large swells that will affect Bermuda, Hispaniola, Puerto Rico, parts of the Bahamas and the northern Lesser Antilles over the next few days. So really, a lot of hot air. Hmmm. Update: I just went in to correct the link to the new document (see paragraph below) and found that the Board Agenda looks like a crazy quilt. I'm not sure what I have seen or not seen. I would say - with no hesitation - that at the end of the voting on the Growth Plan and the Intermediate Capacity Management Plan that will not be one single person in the room who could really tell you what will happen. I'm sure that there are staff and parents who know certain parts well but the whole thing? It will unfold as it will. The district has just unleashed (and yes, that's the word I'm using) a new document for pathways for the North/NE. I'm trying desperately to keep up so did I miss this? Two days before the Growth Boundaries and Intermediate Capacity Plan is NOT the time to hand this out. Who can really digest what this means? - In support of district-wide academic goals. - Equitably across the district. - In accordance with the student assignment plan. - Equitably across each middle school region as appropriate. Yes, that is true BUT the Board has been asking - for YEARS now - for an Equitable Access Framework so that they can help guide this work. This is squarely on Michael Tolley desk and yet, nothing. Banda should not let this continue. I'm looking for the new Board members to add their name to this chorus. First, there will be a meeting - called by the Superintendent - for discussion around renovating T.T. Minor to be the new home for World School. The meeting is tomorrow night, Monday the 18th, at JSCEE at 5:30 pm. I'm not sure what form the discussion will take. The issue is two-fold. One, World School has been consistently ignored by the district and the Board (or takes a backseat to almost every other program, take your pick). At one point, their BEX III money had disappeared. When it reappeared, it was less than had been allotted with no explanation. But the concern is that T.T. Minor may not end being their permanent home. Data indicates that the Central Area growth will need that space. At the Work Session last week, it was suggested if that happens, the district would be able to add a wing to Bailey-Gatzert. This may be true but for two issues. One, B-G is not in the same place as T.T. Minor - it seems like this would add more transportation costs. Two, where would this capital money come from? If the enrollment grows in the next 3-5 years, that might indicate BEX IV money might have to come from somewhere to fulfill this need. Last (and a huge shout-out to Tracy Libros and her staff), information on the APP pathways plus a bonus of info on the amendment process. We note the passing of two wonderful writers - one who wrote for children and one who wrote for adults. Barbara Parks, the author of the series, Junie B. Jones, passed away Friday at age 66. Doris Lessing, a literary giant who won the Nobel Prize for writing in 2007, also passed away today. She was 94. Government bureaucrats will never be able to measure “creativity, appreciation, inquisitiveness” but they are the “purpose of education,” he lectured. From Ed Week's Anthony Cody - Common Core Standards: Ten Colossal Errors. As for Arne Duncan, here's what he is doing in service of Common Core. Understand that there is tremendous pushback across the country and getting louder. Hence his over-the-top remarks. - To get suburban moms on board w/Common Core, @arneduncan says remind them their kids are competing globally, need higher standards. It's a fairly light week but given the seriousness of the Board meeting on Wednesday, perhaps better that way. As I previously mentioned, this will be a long (and hard-fought) meeting to slog through. I can't say for certain, one way or another, if the speaker list will run long again. On the subject of the Growth Boundaries, I would say that, for the Directors, it is likely all over but the shouting. However, there are other items - like the Special Ed Corrective Plan - that many parents will want to speak out on. So even if the public testimony list is 20 people, I suspect there will be questions on the Special Ed issue and Pinehurst (both of which are right before the Growth Boundaries). I don't think the Board will get to the Growth Boundaries before 6:30 p.m.
What will happen is that the motion will be made to accept the Growth Boundaries. From what I recall from previous issues that had many amendments, the amendments will then be discussed so that the Growth Boundaries item can be voted on with amendments. Charlie, am I remembering that correctly? Either way, each director will read his/her amendment and then there will be discussion. There are 15 amendments (and since some conflict with others, I suspect if some pass, that will negate others and they will be dropped). I think this whole discussion could take an hour or more. The Board also has an Intro/Action item - the CBA for the principals - on the docket. This should be rejected because there has to be a true emergency for this kind of action and this doesn't meet that criteria (or we surely would have heard about it sooner and there has not been a peep). Operations Committee meeting from 3-5 pm in the Board conference room. No agenda yet available. I suspect there may be an update about the Mann Building during this meeting but I will wait for the agenda to check and be sure. I know this issue has been passed along to SPD so it is now clearly up to the City to decide when they will execute the no-trespass response. There is also an Executive Session that day to start evaluating the Superintendent so the Operations Ctm meeting will have a hard stop at 5 p.m.
SPS Family Symposium from 10 am to 3 pm. at Garfield High School. The Seattle Times started Education Lab on October 24. Education Lab is supposed to be a public conversation about what works in education. I've just made a quick review of the most recent Education Lab stories, the ones on the front page. About half of them have no comments at all. Nearly all of the others have only one comment. Public participation on this blog appears low. Surely they must be concerned that Education Lab isn't achieving its ambition to spark meaningful conversations about education solutions in the Pacific Northwest. Surely the sponsors are also concerned. Surely the Seattle Times, the Education Lab team, and the sponsors are monitoring public participation as a measure of success? On the other hand, the project is less than a month old. This may not be enough of a sample to form the basis for a judgement. Maybe it's just too early to say. On the other hand, the participation was much, much higher when the project was new. It appears that the initial novelty has worn off and the effort is languishing in neglect. Hey, even if the current amount of participation isn't a concern for the Education Lab team, the Times,or the sponsors, they must want more public participation than they are getting now. It's not due to a lack of interest in education issues. During the same period we here have had literally hundreds and hundreds of comments from dozens and dozens of commenters and over tens thousand page views a day. What can the Education Lab team do to increase public participation in their conversations so that they actually are conversations? Here is the updated agenda for the Board meeting on Wednesday. To sign up to speak, you must call (252-0040) or e-mail (boardagenda@seattleschools.org) at 8 am on Monday morning. New recommendation includes possibly moving Pinehurst to Thornton Creek or JA K-8. - revisions to the Growth Boundaries Action Item. I have not read through these changes thoroughly so I'll ask readers to let us know what they are (and possible implications). Somehow there are 15 amendments on the docket which surprises me because I thought more got whittled down. I see at least one new one which is #9 from Director Patu wanting to NOT change any APP pathways for her district. - the Intermediate Capacity Management Plan has also been revised and again, I have not read through it. 1) On Page 1 (section V1) of the Action Report, it says "I move that the Board approve the attendance area boundaries (Growth Boundaries), feeder patterns, and option school GeoZones as shown in Attachment A to the Board Action Report and direct the Superintendent to take any appropriate actions to implement this decision, including authorization for the staff to make minor clean-up or correction adjustments to boundary and GeoZone maps." "I move that the Board approve the attendance area boundaries (Growth Boundaries), feeder patterns, and option school GeoZones as shown in Attachment A to the Board Action Report and direct the Superintendent to take any appropriate actions to implement this decision for the 2014-15 school year only, including authorization for the staff to make minor clean-up or correction adjustments to boundary and GeoZone maps. Board action will be needed each year to determine whether to implement specific boundary changes and/or feeder patterns for subsequent years." 2) On Page 2 (section V2) of the Action Report, it says "Zone 3 to Van Asselt." Is this supposed to say "Zone 7" to Van Asselt? 3) Didn't Betty Patu instruct staff to change her Amendment 8, to clarify she wants to rescind recommended changes for both the 2014-15 school year as well as in subsequent years? Why isn't that reflected in Amendment 8?" We'll have to see what reply she gets. - Silas Potter was sentenced to 3 years, 7 months in jail. He could get credit for the eight and a half months time that he has already spent in jail. - One accomplice, David Johnson, was convicted in early November of 30 counts and will sentenced in early Jan.
- Potter and Johnson "are jointly responsible for restitution of $168, 275." - The other accomplice, Lorrie Kay Sorensen, was sentenced to 60 days of home detention with electronic monitoring. She must pay $83k in restitution. The most basic lesson is accountability. There was failure from the top down. Dr. Goodloe-Johnson, the superintendent at the time, is the least responsible but she should have realized that Mr. Potter's direct supervisor, Fred Stephens, was distracted by the murder of his son and the subsequent trial. Additionally, employees within JSCEE either feared or avoided Potter; that was a well-known situation and yet no one at the top seemed concerned. Potter never seemed to get challenged on the spending or outcomes and yet there were several directions at JSCEE where he could have been done and was not. Then there were Board Directors Steve Sundquist and Peter Maier. Sundquist had a heads up on something being off but, probably not wanting that dreaded "micromanaging" tag, let it go. Maier was far more culpable and violated what is probably one of the key issues to being on any Board. If you receive information from a trusted source (in this case an independent report generated by the district) about the program, you share that information with the rest of your board. You don't get to use your own judgment about what the board should or should not know. That's what he did. I think this has a lesson going forward about creating specialized programs -whether for staff or students - that don't have real oversight, clear goals and follow-up for outcomes. Oversight provides accountability. Honor Roll? Should We Care? A Florida mom was really upset when she received notice from her son's middle school when he was named to the school's honor roll. Because he received a C and a D and she didn't believe he deserved it. "The bottom line is there is nothing honorable about making a D," the Pasco County, Florida mom told a local news station. "I was not happy, because how can I get my child to study for a test when he thinks he's done enough." In addition to the D, Douglas also got three A's and a C, giving him a GPA of 3.16 — more than enough to be counted among the school's best and brightest. But thanks to his mom, the Pasco County schools superintendent has announced that the honor roll policy will be changed to allow only students with all A's or A's and B's to be considered for inclusion. "It makes my job at home so difficult," Tillack said of the current policy. What does your school do (or not)? When my older son was at Eckstein, no honor roll because "it hurts the other kids' feelings." It made a comeback when my younger son was there. I don't think they did it at either high school they attended (but there was the Honor Society). I think in some ways having an honor roll DOES matter because (1) school is about academics and (2) we celebrate other achievements at out schools, why not academics as well? Seattle Public Schools, via our generous voters and the City's Families and Education Levy, funds a health center in every comprehensive high school in the district (and I believe one there are four at middle schools). There is not an M.D. on site but there are nurses. And what a lot of services: routine/sports physicals, immunizations, vision/hearing screenings, dental referrals,mental health counseling, and wellness counseling. They are hoping to offer dental services at some locations. (Note; there is a special notification for immunization services.) Folks, this is a great gift that voters have given SPS students, for whom some might not ever see a health care professional. And yes, contraceptive services are available. Your son or daughter has access to condoms (usually in a basket by the door, no questions asked), birth control, pregnancy testing, Plan B and abortion services. The staff always counsels students to talk with their parents and get them involved but yes, if the authorization sheet is signed, you do not have to be contacted for your child to receive this information. Also new in the area of birth control is an app from Planned Parenthood (this via the NY Times). One goal of the national Planned Parenthood organization is to be there for those young people — to, as Leslie Kantor, vice president for education at Planned Parenthood Federation of America, put it “reach them in their urgent moment of need.” Their solution was to offer live counselors able to answer questions either by text or through online chat, and their research, published in the Journal of Medical Internet Research, shows that the new program has been successful, reaching more than 250,000 people since it began in September 2010. One advantage of offering an expert instead of an information bank is that a staff member can ask another person questions to figure out what’s really going on, or can make sure that an anxious person really understood an answer, and can rephrase it if necessary. I did not attend this meeting last night. If you did, could you please fill us in? Hogwarts (if it were graded under an A to F school grading law). Thanks to reader Tammy. Looks like Director DeBell is already looking for a new gig - he's applying to be a PCO for the 43rd district (where apparently he lives now). It may be a prelude for the appointment to fill the representative seat being vacated by Jamie Pedersen in the 43rd (Pedersen is filling Ed Murray's senate seat). By coincidence, I live in the 43rd. Hey, look who The Stranger thinks is one of the smartest people in Seattle politics. Silas Potter will be sentenced today for his crimes against Seattle Public Schools after pleading guilty to 36 counts of theft in April. Meg Diaz, Kellie LaRue and Charlie - all in the same place, all smiling. Seattle Public Schools is committed to preparing all of our students to graduate ready for college, careers and life. The goal of the Family Symposium is to support our families as critical partners in their students' academic success. At this symposium, families and community partners will learn how to support student academic achievement at home and in the community. Math, Science, Reading/Writing, Early Learning, Community Arts, Understanding School and Student Data, College and Career Readiness, and much more. Staff has done an incredible job in creating the various plans. No one can truly know how long it must have taken and the tedious but important job of determining walk zones, ripple effects (if this, then that) and all the other issues they had to take into account. So why so messy and why so much confusion? My view (not shared by Kellie) is that the main flaw WAS the public engagement. Kellie believes the problem was never truly expressed so the answers were always to be confusing and flawed. I believe that I think I know what staff problem staff was trying to solve but that they never engaged their stakeholders correctly in the first place and so, never had real buy-in AND created mistrust. The old set-up for these meetings - presentation, breakout groups, no rationale for plan details and no ability to ask questions - has got to change. They did get through all the amendments (and kudos to Director Peaslee who worked hard to get it done). I guessimate about 50 people there (and I thought there would be more). Banda opened the Work Session saying "it's been a bit of a rollercoaster" - I don't think he was trying to be funny but sure, just a bit. He said that this whole process was about "accommodating increased enrollment" and adjusting for the BEX IV building. Also, as to the volume of amendments, it became clear that the Directors had no intention of passing all these. Many seemed to be thinking out loud ideas to bounce off each other that would not have been discussing if not put forth as an amendment. Also, the staff is going to strive to get any agreed changes to the last version of the plan by Friday but if they are not able to, then some amendments that are slight changes may be grouped into one amendment. Ready? Get a cup of coffee and here's what I heard. As Blogger is quite wonky on my iPad, not a lot here. One thing is clear - there will be no delay. They are going through the 21 amendments and no one is saying, hit pause. The district has a sheet on Assumptions. One is a change from 10-year planning to 5-year planning. Two is APP projections and how the program has grown. Three is implementation "5-year planning horizon, in conjunction with annual implementation decisions, allows for mid-course corrections. Link to all the handouts including amendments. I caution you that much of it - without explanation - may not make sense. I wasn't able to attend the Executive Committee meeting this morning but Board staff were kind enough to give me the handouts (thanks Lily and Teresa). As a heads up, a couple of things from the Legislative agenda (aka School Board agenda). - November 20th. The Growth Boundaries discussion/vote is the fifth Action item on the agenda. Two items ahead of it will likely go quickly but the Special Ed item and possible closure of Pinehurst are likely to have some amount of discussion (and, with any luck, Pinehurst will be pulled off the agenda). Altogether the Boar has 13 Action items to vote on (whew!) plus three Intro items. One of those is acceptance of RTTT money for the three IB programs. I let you know this simply if you are trying to time your arrival (unless you want to come for Public Testimony but by then, it will all be over but the shouting). If I had to call it, I'd say the Growth Boundaries discussion and vote will not start before 6:30 p.m.
As well, there is no item on either the Action or Intro list for the Mann Building. This agenda sees the election of new Board officers. I would presume that means that the new Directors will be inducted somewhere between November 20-Dec. 4th. My guess would be Sherry Carr will be the new Board President. Parents do the work to defend their schools and Pinehurst is challenging the per student figure for Pinehurst students versus other students. As usual, parents step up with extensive research. Pinehurst is no exception and here is a letter to Superintendent Banda asking for an explanation of the costs announced to the Board per student at Pinehurst versus other K-8s. Labels: 1240 lawsuit, Pine, Pinehurst, school closures.